Trial versions of Balanced Scorecard Customer Relationship Metrics and Balanced Scorecard Designer are available for download. Download Customer Relationship Metrics. Download now! Download Help Desk Metrics. Download now! Download Call Center Metrics. Download now! Download Product Knowledge Management scorecard. Download now! Download Interactive Voice Response metrics. Download now! Download Call Center Outsourcing scorecard. Download now! 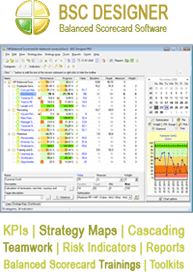 Download 30-day trial version of Balanced Scorecard Designer. Download now! If you tried scorecards and Balanced Scorecard Designer and have a purchase decision, please, visit ordering page for more information.